Elsa Dorfman in her Cambridge studio with her Polaroid 20x24 camera. CAMBRIDGE — A visitor stands in the lobby of the building on Massachusetts Avenue where Elsa Dorfman has her basement studio. “You here for Elsa?” a janitor asks. Say “Elsa” around Cambridge — or in the photography world — and people know who you mean. 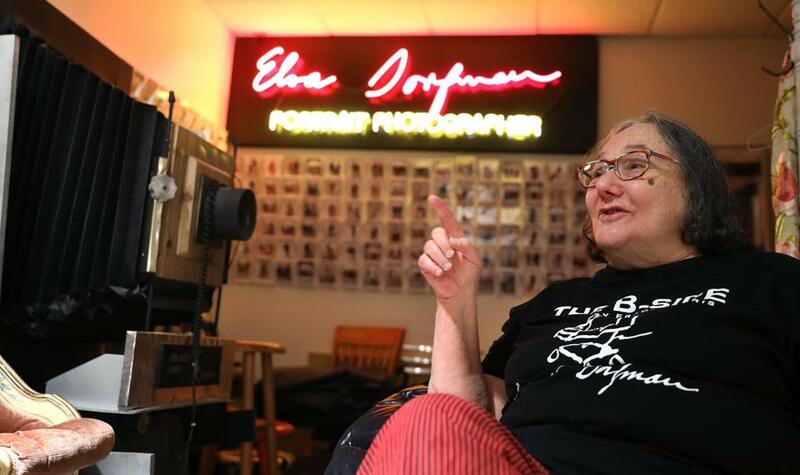 Thanks to Errol Morris’s new documentary, “The B-Side: Elsa Dorfman’s Portrait Photography,” a lot more people are going to be on a first-name basis with her. It screens April 29 at the Brattle Theatre as part of the Independent Film Festival Boston. The documentary officially opens here on June 9. “The B-Side” might be considered an early birthday present. Dorfman turns 80 on Wednesday. Dorfman’s married to someone else on a first-name basis with a lot of people he’s never met: criminal-defense lawyer and civil libertarian Harvey Silverglate . The couple have been Cambridge fixtures for nearly half a century. “Famous on Flagg Street,” Dorfman says with a laugh. Their son, Isaac, works in advertising in New York. Nafis Azad, left, held up a photo just taken of Dorfman, right, and Margot Kempers. Dorfman to know her, so to speak. Her moon face is almost as identifiable as her don’t-try-this-at-home fashion sense. Jumpers and running shoes? Of course. Polka dots and stripes? On occasion. More important, she has a personality as big as the Robbie-the-Robot-size Polaroid 20x24 camera that dominates her studio. Looking like something out of a steampunk fever dream, it’s one of only six ever produced. Several photographers have made extensive use of the 20x24 Polaroid camera, including Mary Ellen Mark, Timothy Greenfield-Sanders, William Wegman, and Chuck Close. None has been as associated with it as Dorfman. 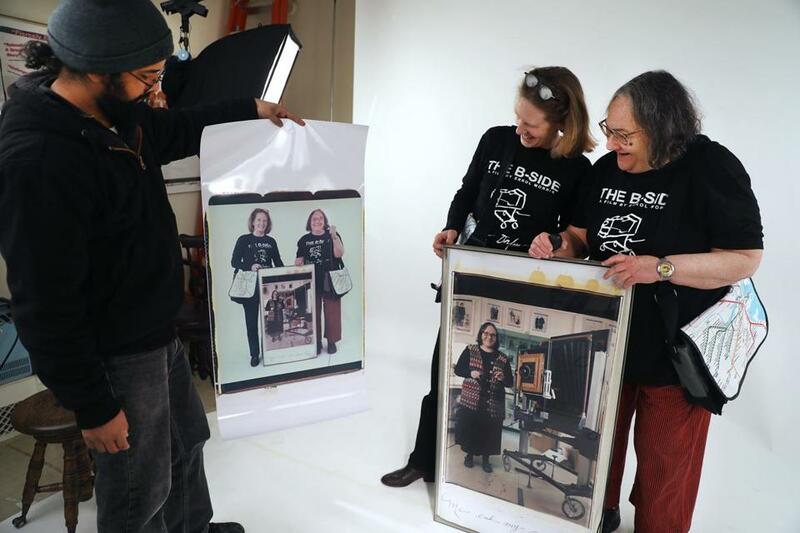 B-Side,” “I somehow have this misguided therapeutic idea that it’s my role in the universe to make people feel better.” The hundreds and hundreds of Polaroid portraits Dorfman took over more than three decades suggest that the idea might not be so misguided. Like small-size Polaroid instant cameras, the 20x24 makes a unique print, developed within the camera and then extruded from it. The resulting image is phenomenally detailed, with notably full, rich colors. Dorfman’s work has a distinctive look. She would use a white background, include white borders, and leave in roller lines (Dorfman calls them “tire marks”), which are left by the rollers inside the camera that break the chemical pods used in developing the image. Finally, using a steel-nib pen dipped in black India ink, Dorfman would write a caption on the bottom and sign the image. She started doing that with her photographs well before the Polaroid camera came along. Her work has always included text with image. That’s as it should be. Asked if she had youthful ambitions of being a photographer, Dorfman leans in and says sotto voce, “Not a photographer, a writer!” Much of her early work consisted of author portraits, particularly poets, and Allen Ginsberg was both mentor and close friend. In a real sense, Dorfman’s one of the last Beats. Dorfman first used the 20x24 in 1980, for a dual portrait of Ginsberg and the poet Peter Orlovsky. It was a fitting start. Ginsberg and Orlovsky were partners, and Dorfman’s family portraits are her most celebrated work. As distinctive as the look of Dorfman’s big Polaroids is, their emotional fullness and warmth may be even more so. “People would come to me because they really love their families,” Dorfman says. “That always shocked me. You know, Jewish families are very loving but they never say they love you? They’re like, ‘That was good — can’t you do better?’ So I’m surprised how much love there is. The awful thing is that I’ve had people who I know divorced, and I’ll look at their picture and think, ‘How can this be? How could this have happened?’ Then I feel like, ‘I have to help. I can’t let this go on: You can’t do that to my narrative!’” She laughs that Elsa laugh, knowing how ridiculous this sounds. The laugh doesn’t last as long as usual, though, since she’s partly serious. Local is not the same as parochial. Dorfman went to Brussels to work as a waitress at the 1958 World’s Fair. The photographer Weegee tried to pick her up. “I didn’t know who he was!” She lived in Paris, where she became friends with the writer Susan Sontag. (“Her French was so much better than mine”). They lived in the same student hotel. Moving to New York after graduation, she got a secretarial job at the publishing house Grove Press. That’s where she met Ginsberg, as well as the poets Robert Creeley, Charles Olson, and Robert Duncan, and the photographer Robert Frank. Dorfman moved back to Boston, got a degree in elementary education from Boston College, and taught fifth grade in Concord for a year. One of the more amusing moments in “The B-Side” comes when Dorfman describes a sympathetic parent telling her, “You don’t really belong here.” Dorfman felt that way, too, and went to work for EDC (Education Development Center), in Waltham. Serendipity struck. She was handed a camera, a Hasselblad, and put to work in the darkroom (which had been set up by Berenice Abbott, no less). That was the first time she’d used a camera. She was 28. Photo courtesy of Elsa Dorfman. 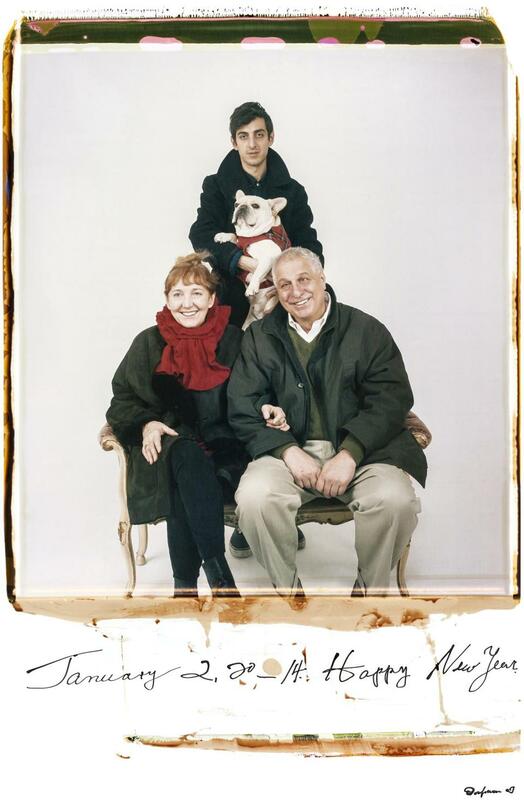 "January 2, 2014 -- Happy New Year (Julia Sheehan, Hamilton Morris, Ivan, and Errol Morris)." B-sides,” he said, the term used for the non-hit, or flip, side of 45 rpm recordings. She mentioned this to Morris, who fastened on it for the documentary. “It’s the perfect title,” Dorfman says, “Even to this minute, I’m really a B-side person,” she laughs. When someone suggests she’s proud of that fact, Dorfman laughs even harder. It’s a very Dorfman attitude. This is a woman who ends every e-mail with “Onward.” If she neglects to include it, she’ll immediately send another one that does. That word was Creeley’s standard farewell — they collaborated on a book, “En Famille,” in 1999 — and Dorfman, in tribute, adopted it after the poet’s death.